Rain-X Wipes feature the original Rain-X formula in an easy-to-use towellette. Simply apply the Rain-X treatment to exterior glass and watch the raindrops fly off your windshield while driving. 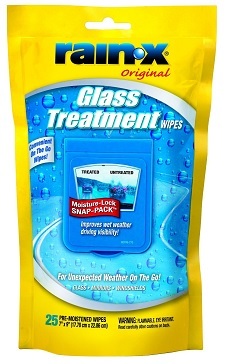 Moisture-Lock SNAP-PACK packaging is compact enough to be stored in the glove compartment or car door. Improve all-weather visibility, safety and driving comfort. Helps easily remove frost, ice, salt, mud and bugs.